I’m a kid’s art hoarder. I just can’t help it. I take pictures of all my girls’ arts and crafts, but I still have a very hard time throwing any of it away. Please tell me I’m not alone! This year, instead of throwing it away, I am reusing it. 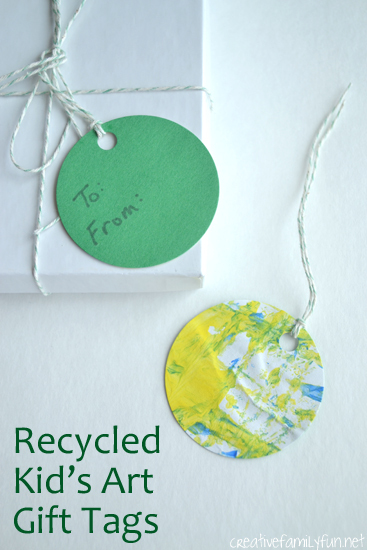 These recycled kid’s art gift tags will look great on all your Christmas presents. 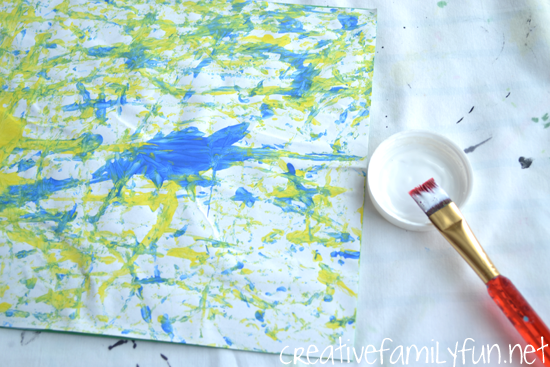 The relatives will adore it and the kids will love seeing their artwork under the tree. It’s the perfect solution for that hoarding problem. Sort through that pile of old artwork and find some stuff you want to try use for gift tags. I found some cute old paintings, including this fun piece of marble painting. Try not to use anything with a 3-D element, since you’ll be cutting it into pieces. 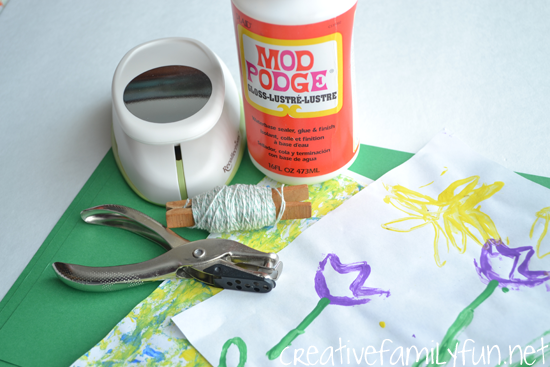 Use the Mod Podge to glue your artwork to a sheet of card stock. Spread a thin layer over the entire piece of card stock. Work fast; it starts drying quickly. Place your artwork on top and press down, smoothing out all the wrinkles. Let it dry for at least a half hour. I left mine under a heavy cookbook to flatten while drying. After everything is dry, grab your circle punch and start punching. I punched as many circles as I could from my artwork. 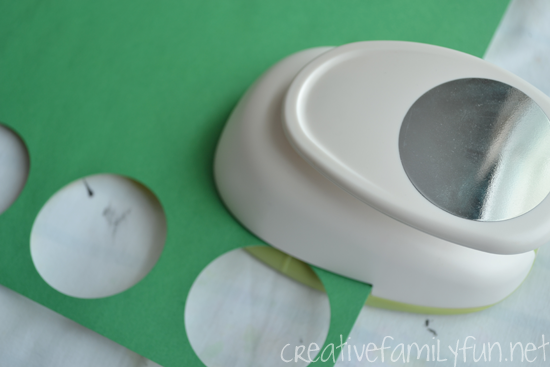 If you don’t have a circle punch, you can cut small squares or rectangles. They would all look great on your packages. Use your small hole punch to punch a hole in the top of each gift tag and tie string through the hole to attaching to your Christmas gifts. The card stock on the back of each tag will give you a great surface for writing. What are you waiting for? 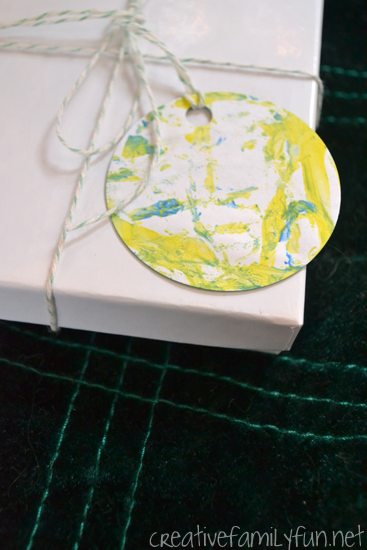 Recycle your kid’s art and make some simple and unique gift tags for all your packages.